The Langtang Tara temple (Wyl. glang thang grol ma lha khang or glong thang), or Den Drolma Lhakang (wyl. 'dan sgrol ma) is a famous Tara temple in Langtang, at a place called Denkhog or Denma (wyl. 'dan ma) north of Dergé in Kham. The temple has three images of Tara, one of which is said to have spoken. 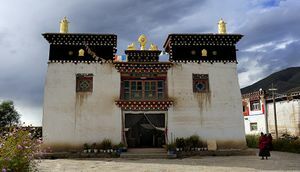 It was established at the time of King Songtsen Gampo as one of the thirteen geomantic temples built to tame the demoness and guard Tibet. ↑ The Great Tibetan Dictionary says it is one of the four 'region subduing temples', whereas Tertön Sogyal's biography says it is one of the four 'border taming' (tadul) temples, and the Mani Kabum says it is one of the four 'farther taming temples' (yangdul), which, by looking at the supine-demoness superimposed on the map of Tibet, seems to be the correct attribution.